The Implementation of the Ithuba Community (Skills) College started in 2007. In the past 4 years the school grew rapidly through the construction of classrooms, halls and workshop-space with buildCollective, different European architecture universities and local labour force. The founder and holder of the school is the Austrian NGO s2arch. 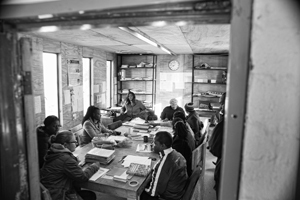 As built space, number of learners and infrastructure grow the overall development, organisation, management of the different departments and network, as well as practical education, maintenance and relations between departments and participants got a bit left behind. The 8 weeks construction or even shorter periods of guest- teachers and other projects with their event like character cannot provide long term strategies or foundation for the school programme. Principal, teachers and staff are busy with the daily business and are neither capable nor authorised of overall decision making concerning the school development. The approach laid mainly in developing strategies to formalise and strengthen relation and responsibilities of and between the different departments and programmes (academics, wood and steel, sewing, garden and catering, facility management, maintenance and repair, art/dance, construction projects, volunteers,… ) as well stakeholders and management. Another issue was the identification and addressing of current challenges and networking with local organisations, government and supporters. A report and summery of experiences, contacts, strategies and suggestions of development will be handed over to the organisation s2arch.